Continuing the series’ World War Two heritage, Sniper Elite 4 delivers critically acclaimed gunplay across the striking landscapes of wartime Italy, from sun-drenched Mediterranean coastal towns to giddying mountain monasteries and more. Sniper Elite 4 combines genre-defining ballistics, breathless emergent stealth and gripping third-person action. 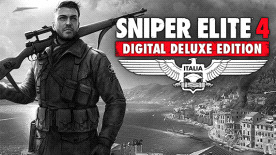 Experience unrivalled freedom across levels many times the size of Sniper Elite 3’s. Exploit the environment, carve your own approach, manipulate the battlefield and hunt your enemies. As covert agent Karl Fairburne, fight alongside the Italian resistance and help free the country from the yoke of Fascism. Face a terrifying new threat with the potential to halt the Allied fightback in Europe. Featuring an explosive campaign for 1-2 players and dedicated co-op & multiplayer modes, Sniper Elite 4 is the definitive WW2 shooter for a generation.